I’m no stranger to a Hot Toddy. I remember being very young and my mother making these for me when I was sick. Way better than NyQuil I’m telling you. I know this is something that has been in my family for years because my grandmother made them as well. When children became ill, whiskey and tea were almost always in the house. 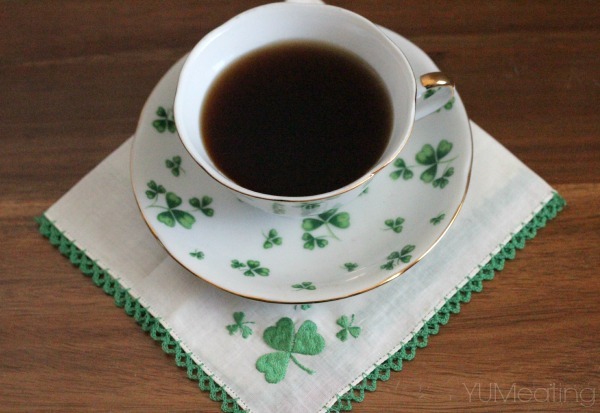 What better way to create a homemade NyQuil using materials on hand instead of rushing out the store for processed cold medicines. I think our grandparents and great-grandparents were really on to something. Of course, I am pretty sure when I was younger there wasn’t a whole lot of whiskey in the Hot Toddy but just enough to help me fall asleep and rest. In those days my tea was usually mixed with Jack Daniels or Crown Royal. I know, not very Irish of my mother, right? My grandmother’s usually had Kessler brand whiskey because that mixed with water was my grandfather’s drink of choice. Again, not very Irish of him, eh? On a good day you’d find a bottle Bushmill’s. Now that I am adult, I enjoy a Hot Toddy when I feel poorly or sometimes just for the heck of it! 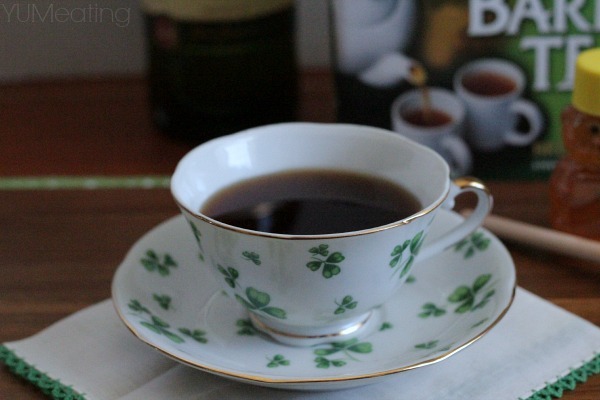 First, I start off with some Irish Breakfast Tea. Then, I add some Michigan made raw honey and Jameson’s Irish Whiskey. The cute little bear of honey you see in this photo was a Christmas present from my mother-in-law. It came with a mug, some tea and some lip gloss. The honey and lip gloss (if I understand correctly) was made by her niece. Husband said the beeswax and honey come from someone’s farm, but I can’t be sure what he said. I’m old. I forget things. 😉 I’m also a huge fan of Great Lakes Michigan Raw Honey light seen in the photo of my Oatmeal Explosion (aka Crockpot Oatmeal.) Feel free to use any type of honey you prefer. Fun Fact – Bushmills distillery was founded in 1784. Jameson’s was founded in 1780. 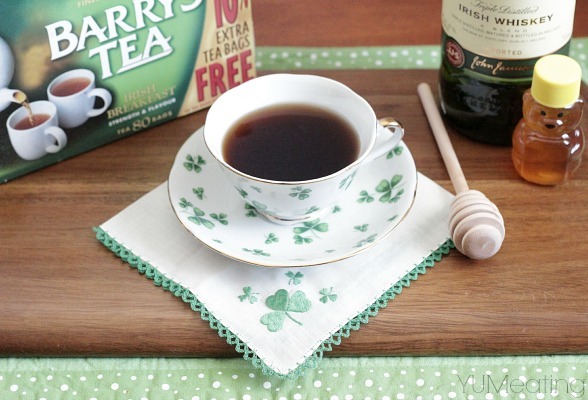 Tea was allowed into Ireland in the late 17th century and they drink more tea per capita than any other nation. You can either microwave your water in a mug to heat or use a tea kettle. In a large tea mug add the 8 oz. of water. Add the 2 oz of Irish whiskey. This will heat the whiskey and cool down the water just a bit. Steep your tea bag in the hot water and whiskey. Add the tsp of honey and splash of lemon. Add slice of lemon if you desire. When was the first time you had a Hot Toddy? Please share your Hot Toddy memories in the comments below. I love reading and responding to them! This is absolutely THE perfect thing to sit and relax with on a winter day. Yum! This is a recipe my husband would really LOVE! He is part Irish and really into his drinks. I’ve always heard the word Hot Toddy but I have never known what it was! What is the difference between Whiskey and Irish Whiskey? ‘Whiskey” can be any whiskey, made anywhere. Like Jack Daniels is made here in the states. Irish Whiskey is made in Ireland and imported. Or, its started in Ireland, imported and a distillery finishes it and bottles it here. All whiskey makers have a very different creation process for flavor. Much like wines and craft beers. This sure sounds wonderful. I love those plates and napkins by the way. This sounds perfect after a long day! Especially on a cold winter night! This is the drink my dad used to bring in a thermos to Jets games when I was a kid. Of course, back then it was OK to bring your own drinks and no one checked if there was booze in it. And no, I wasn’t allowed to drink it. Instead, he’d buy me a hot chocolate! Later on, I’d make my own hot toddies when I had a cold. Love this. We used to get them (less alcohol) when I was younger. I have never heard of this before. It sounds perfect for a cold day today! I always keep stuff on hand to make a hot toddy. You never know when someone is going to get sick. Sounds really yummy. I’ve heard of a hot toddy, but I’ve never had one. I think I’d like it for sure.